Well I tatted that pesky irritating! little flea and now it's the turn of a genuine parasite. Parasites generally cause serious harm to the host rather than just being annoying and this one is no exception. 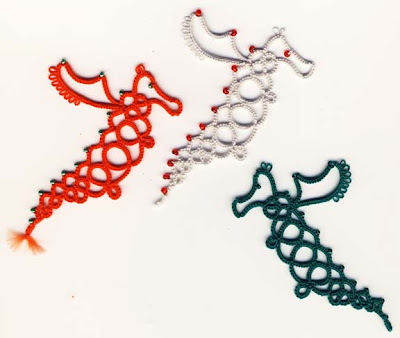 Martha Ess designed and tatted a nasty little parasite as a pair of fun earrings for a friend with whom she worked. I have been attracted to this pattern since I first saw it a good while ago. Mmmmm I though that name that sounds familiar! In the far distant past when I took my Zoology Degree we did a course on parasitism, so out came my 'Girls Book of Parasites'(doesnt everyone have one?? ),actually it's 'Introduction to Animal Parasitology' by J.D. Smyth. When I found it my first though was 'Aw my gawd I used to know all this!' well some of it anyway! 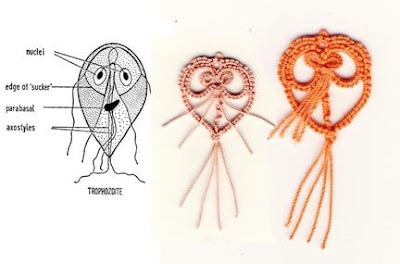 This is the drawing I found of this nasty little critter (Sorry but I have had to remove the name of the parasite from my blog as a huge number of my blog visitors don't come for to see tatting but have looked up this name and been directed to my blog as an information source!!). It is described as looking like a 'tennis racquet with out a handle' and has a somewhat comical face like appearance. 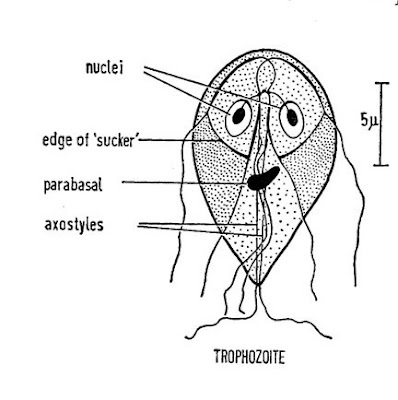 It is a protozoan single celled animal that swims around using it's four pairs of flagellae. What seem to be eyes are in fact two nuclei. A parasite of man it lives in the duodenum and I think there we should draw a veil (a tatted one of course! )over it's lifestyle!! Martha's design is the stage illustrated in the diagram, this is the active part of the life cycle rather than the cyst stage where it passes from host to host mainly through contaminated drinking water. OK enough of the science stuff lets get to the tatting!! Martha tatted hers in a pale green and I got to thinking what colour would a parasite of the gut be? First choice was a cheery bright apricot in size 10 flora, no point in telling you what this one measures!! Second version in a rather more gut coloured dusky pink Flora 20, that's much more realistic! Putting it all together I think Martha made a cracking job of it,and this pattern is a little gem. Anyone else want to tat it. Next animal to fly off my magic shuttle is a Dragon. Yes, I know I said I was going to tat realistic animals...but who really knows if dragons really do exist.I am sure we all know a few contenders!! This is the only dragon pattern that I have (I think) tho' I know there are lots around. This is Paprika the Dragon from the endlessly inventive mind of Martha Ess. What would I do without her! This trial Paprika is tatted in size 10 Flora and measures nearly 11cm head to tail. But he isn't really a good paprika colour so he had to have a friend and more. The beauty of tatting an unrealistic animal for a change is that it doesn't have a realistic colour that has to be aimed for. These little fella's are in Flora 20 and measure 8cm head to tail. One has a fringed tail which saved hiding ends! He really is in Paprika colour. It's a nice pattern to tat. Jane Eborall recently blogged about her favorite doily (Nov 9th 2007). Mmmm!! I thought, that looks familiar! So off I went at a run into my craft room to look at my doilies, fastened to my display board, where they have hung since 1985 when I took a demonstrators test. Secured with bits of Scotch tape (ouch!) there was my doily. Amazingly the tape left no sticky marks at all and the doily was perfect. 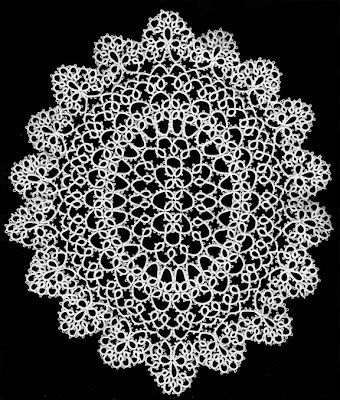 Yes, indeed my doily did look exactly like the pattern that Jane shows, but Jane's own very frilly version looked very different. Here is my doily. 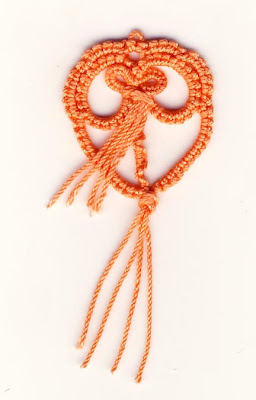 It looks pretty sensational to me, apart from the horrific little frayed knots that jump out at me. Tatted in a fine thread prob 60 it measure 9 inches. I guess I made this in about 1984, in the days of good eyesight and lots of patience! Jane says that it is called 'Snowflakes' and is from Penelope Book 4. By 1984 I was the proud owner of 2 shuttles and 4 tatting books, Coats Learn to Tat(nowhere to be found now! 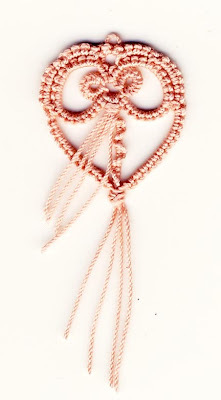 )Coats Learn Tatting (1088),Coats Tatting (919)and my absolute favorite The Craft Of Tatting by Bessie Attenborough. I had never heard of Penelope Books until recently so where did I get that pattern? I wonder if I found tatting books in the library, that seems so unlikely. 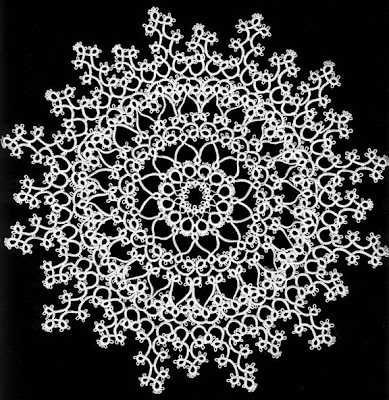 Now given that I only ever tatted 3 doilies in my tatting life until this year (see earlier entry on doilies), it seemed pretty amazing that Jane and I should have made the same doily way back when! I learned to tat in about 1958 from a school friend, using a vulcanite/hard rubber (I think)shuttle inherited probably from my great grandmother. That and my Learn to Tat book were my only tools until the 70's when I acquired a Milwards Shuttle and the two Coats leaflets in Ireland. These were riches indeed! My very first doily must have been from Learn To Tat, I even made it again in pale blue (gosh we had colour!). Again made in Coats Anchor Mercer 60 it measures 7 inches, and must date back to the 1960's. 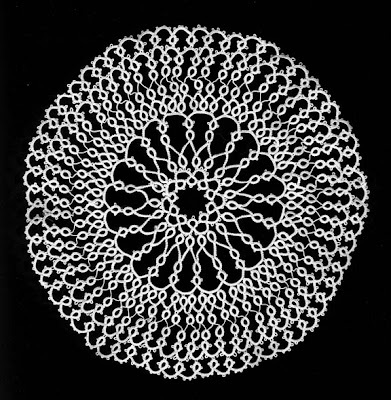 My 3rd Doily is from The Craft Of Tatting, my copy is a reprint dated 1984 so I guess that is when I made the doily. This has to be the biggest thing I ever made, in size 60 thread it measures a full 11 inches, wow. I can't believe I made this. It was actually made for a test run under the Country Markets Produce and Craft Programme. The Tatting test required an article made entirely of tatting, an article trimmed with tatting and a sampler showing stitches and a variety of medallions.If one got an excellent in the test one could take the Demonstrator's Bar test which involved making a whole lot more visual aids and really knowing your stuff. I took these tests in 1984/5. 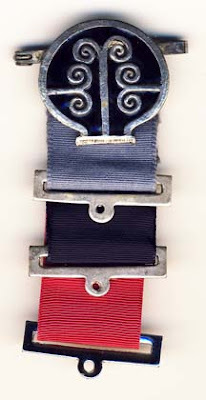 The award is called a 'Brannra'. The original brannra is a bread iron made by a Donegal blacksmith and was used to cook oatcakes in Irish country homes. This simple design stands for country craftsmanship at its best and was chosen by Country Markets as its sign and Test Award. After that I went into tatting decline!! suffering from too much white! and a bad neck and shoulder 'till I looked up 'tatting' on the internet in 2003. WOW!! how different is what I do now. That's enough reminiscing for now. must get back to my challenge. Well cats are soooh variable they almost count as different species ( except that they can interbreed! ), different enough to blog seperately anyway! Siamese cats with their blue eyes, Burmese cats, Persian, even Manx cats with no tails. Just read that there are 36 recognised breeds of pedigree cats around the world. 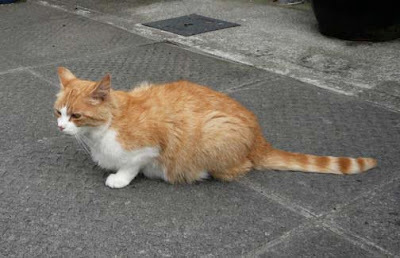 Most common tho are the Moggies found in almost every household, Tortoiseshell ones, Scary/Lucky Black ones, Tabby ones, Black and white ones and my favorite the Ginger cat. 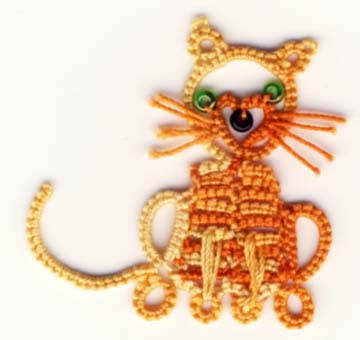 So this time I am tatting Ginger cats, are they the same as Marmalade cats I wonder, or do they have more brown in them. This time I am going to start with the most complicated pattern I tatted. This one is by Inga Madsen from her book of Tatted Animals. When I first tatted this cat in 2005 I came across T.S.Eliot's poem the 'Old Gumbie Cat' and for me Inga's cat will always be a Gumbie cat even tho' my cat is not quite the colouring described in the poem. She sits and sits and sits and sits—and that’s what makes a Gumbie Cat! And when the family’s in bed and asleep. She teaches them music, crocheting and tatting. Tatted in variegated Flora 10 he is 9cm wide and 12cm tall. It is a lovely pattern to tat especially if you enlarge the diagram (it's a diagram only pattern) and colour in each ring and chain as you tat them so that you know exactly where you are. 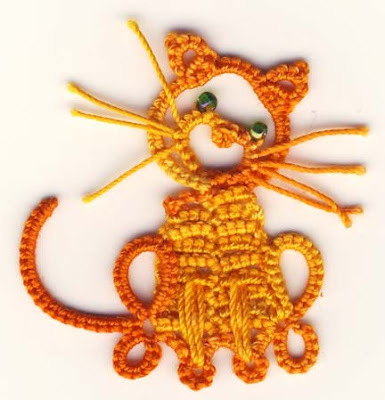 Jane has also designed some Ginger cats,standing , sitting,and sleeping but I just haven't got around to tatting them yet. 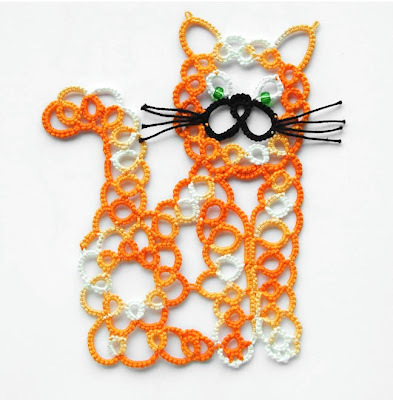 I did try Mark's scary Halloween cat (see last post in this blog) in ginger threads and boy does it look as if it is about to spit! Jane gave me a tip to leaving the scanner lid up to get a black background and it works a treat. 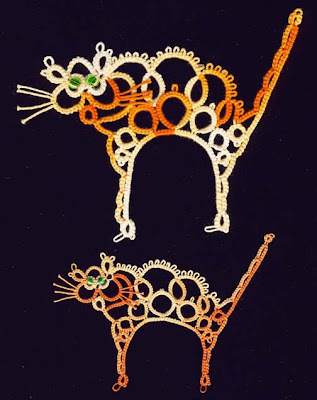 The big cat is in Coats Floretta 20 variegated and measures 5.5cm from toe to highest part of arched back the little cat is in vintage J&P Coats tatting thread 70/80 and stands at 4cm tall. 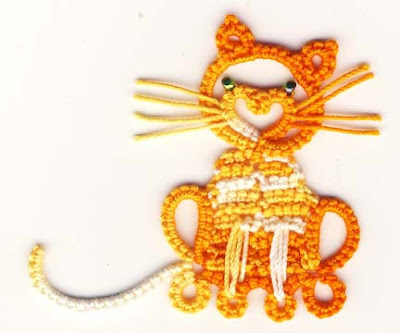 Next up are my favorite cute cats by Martha Ess from New critters on the block. These cats are so cute that I couldn't stop making them. This one is made in Flora 10 variegated and is 5cm tall. Next a smaller one in variegated Oren Bayen 50 (tats like a 30) he is 3.8cm tall. 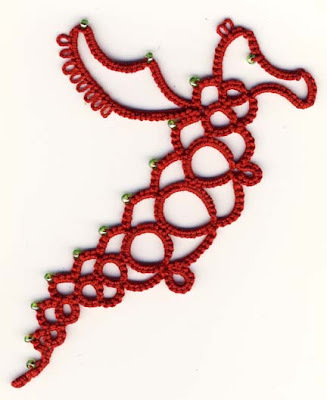 This is such a rich colour mixture and I am getting to like the Turkish threads for tatting animals. I would just love to have thread like this that had some darkish brown in it too, as lots of animals have that sort of colour range. Getting smaller still a teeny weeny kitty in vintage J.P.Coats tatting thread a 70/80. Again a super colour combination. He is 2.6cm tall and has a bead for his nose. Here you can see the relative sizes. When ever anyone sees my work they always ask me what I am going to do with it and I usually answer nothing, I just make them and look at them. 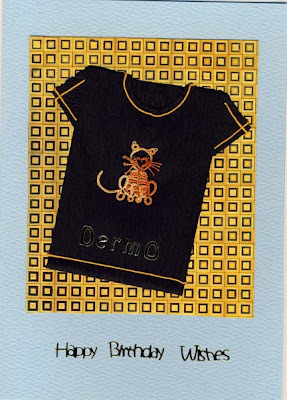 But this time I actually made a card with a cat on it. It's for my SIL's (son in law/son in love) birthday. 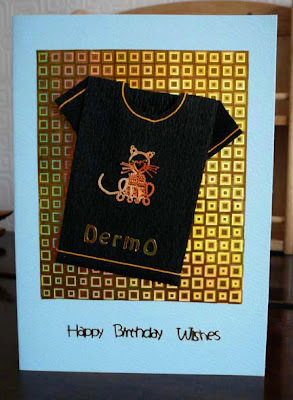 Second photo gives you a better feel for the materials, the T shirt is origami made with black crepe paper and it is mounted on gold holographic paper which really makes it 'zing'. Why the black T shirt...his favorite colour. Why the cat.....well. My daughter and SIL moved into a new house in the summer and with the house they inherited a cat...as you do! There are 3 gorgeous ginger toms living near us and there is almost always one draped on my car or flat out on our deck..think one of them particularly likes to get away from grandchildren! Sorry I digress...back to their cat, Mrs Norris (Harry Potter fans will recognise this name!) 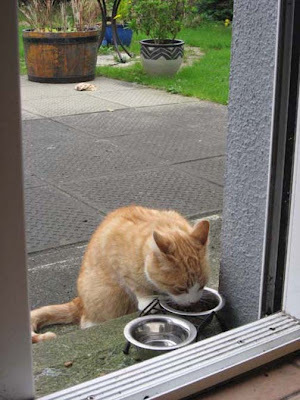 Mrs Norris is a stray, fed by several households! 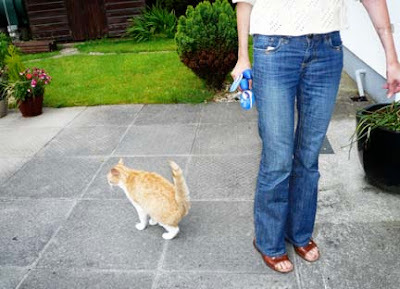 ............'Dogs have owners, Cats have staff' ..Anon... Now how true is that! She (probably a he!) 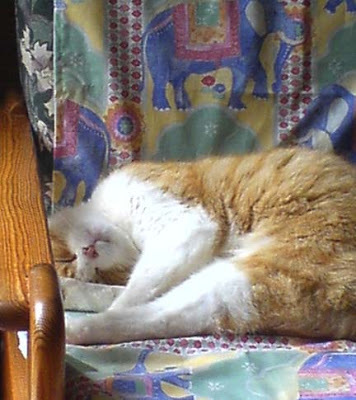 was NOT a house cat,NEVER came into the house but had a smart little house of 'her' own outside. 'She' seemed to be the perfect pet especially as my DD has allergies to animal fur. She loves cats but this one was not a lover of people, HATED to be stroked or fussed over, not that they could get near enough to 'her' to try. I had expected 'her' to be a scraggy, grumpy old cat but when we went to visit found that 'she' is a very pretty cat indeed. 'Twas true that whenever anyone went near 'her' she would always turn 'her' back and walk away. 'She' was quite happy to eat 'her' meal just on the other side of the patio door, in fact 'she' would wait there in hope but never ever ventured inside. Within a short time my husband who has a certain love of all animals remarked that Mrs Norris DID like to be stroked, in fact purred with contentment. Had he found a way through 'her' shell of indifference!! 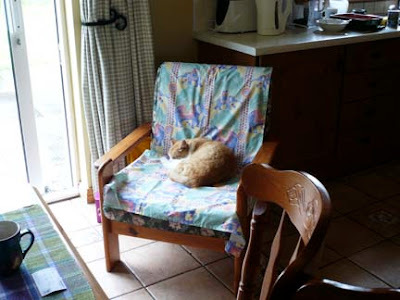 Imagine our surprise when the next time we went to visit there was Mrs Norris as happy as only a cat can be, on her own blanket in an armchair, admittedly near enough to the door for a quick escape if necessary. I wonder what will happen next!